The Big Idea: Multiple choice questions can deliver powerful data. The Quick Key Blog is proud to bring you tools for writing effective MC questions, that require critical thinking, and yield powerful data. In my years as a classroom teacher, I was very familiar with multiple choice questions. When I started teaching, to be honest, I did not like them very much. As I developed in my practice, and learned how to craft powerful multiple choice questions, I began to rely on the accurate data they could provide. 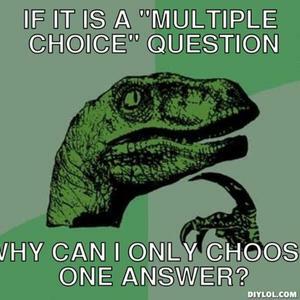 Multiple-choice questions are a method of assessment that asks students to select one choice from a given list. They typically have three parts: a stem, the correct answer – called the key, and several wrong answers, called distractors. Multiple-choice questions are most widely used for measuring knowledge, comprehension, and application of learning outcomes. Article continued…..